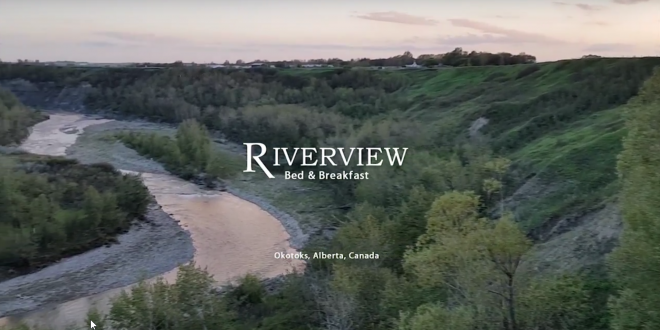 Inside our 10,000 square foot Bed and Breakfast you will find full amenities including beautiful views, fitness room, large projection Movie Theater and Games room for you to enjoy. Other features include comfortable beds, private en-suite bathrooms, high speed wireless internet, and flat-screen TV’s in all the rooms. Six bedrooms, each with a unique view, ensuite bathroom, furniture & comfortable beds. 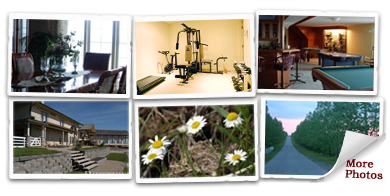 Games room, hiking trail, movie theater and fitness room among others. Also read about the surrounding area. 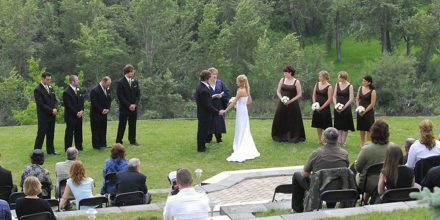 We are the ideal venue to host your Outdoor Wedding Ceremony. 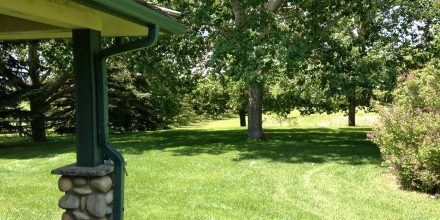 The property is perfect for large groups of people and wedding photos. View Google Map & get driving directions. Wedding Venue Video TourWatch our short video walkthrough of the outdoor areas of the B&B including the terraces and front lawn areas. (01:07) Footage was taken in August 2016. Gearing up for SummerA few of the things we do every year to get ready for the coming year including planting flowers. Are you a local Photographer?Use our form to submit your info to be included in our list of photographers.